so far i have been counting down nonchalantly. preparing for this babe at a steady and reverent pace. counting down in the only way i know how. i have been reading stacks and stacks of books. (the good, the bad and the ugly. i have a list of favorites if any of you are interested.) i have been visiting the doc regularly. (it amazes me that he can put his hands on my belly and know exactly what position the babe is in.) i have been clicking my weekly emails updating me on which fruit most resembles this growing fetus. i have been doing my mama yoga dvd and i have been telling dan every evening that our babe is either a.) trying out for the circus or b.) heavily involved in Dance Dance Revolution or c.) attempting to catch the hot tamale train. i have not yet started counting down the days. yet i see these li'l baby widgets floating on friendly mama blogs all over. so i finally decided to throw my babe into the ring and see where we are in calendar days. though i will be honeymooning with my sweetheart and a sidekick sweetheart. what could be better than that? we will go into the hospital as man and wife and come out as a family. so i enter my lucky numbers and await for the widget to appear. i feel like tom hanks on big as he stands in front of that carnival booth with the gypsy and her magic crystal ball. and the reading: 56 days. only 56 days to go? are you kidding me? i can barely believe my eyes. i get to meet my li'l guy in only 56 days!? that is fabulously fantastic. i can hardly stand it. though 56 days seems closer than i had imagined. is 56 days enough time to prep for an event like this? can i smooth out all the wrinkles in my world in only 56 days? does this li'l boy realize what he's stepping into? can we fix global warming in 56 days? 56 days. wow. so i guess i'll be counting them down now. tomorrow will be 55 days. only 55 days! have sudden urge to fasten the circus animal mobile onto our crib. oh how that 55 days can seem like both an eternity and a blink of an eye! Mowda, I can't believe it is so close! seems like yesterday that you sat on me desk with that look in your eyes, and said, "meggie... i have something to tell you..."
Ooh, definitely share your favourite baby reads. I'm about 3 weeks behind you and all the books I keep borrowing from the library seem to be duds. I have to chuckle a little at my little countdown widget. In my case it just represents when I need to start packing my bag and washing baby clothes, as my babies have all been late coming. Have fun these last two months! It's a magical time before passing through the portal of parenthood. That's my problem! I never went to birthing class. No wonder my kids are maniacs! M - love your blog. Love reading your writing. Let me just say, forget about wrinkles - get a bottle of febreeze and take the advice on your post titled "leave things undone" This will soon become an art if you can embrace it. It's tough, but makes all the difference! Best of luck in these last 56 (give or take a few) days! you've been ready for this event your whole life, so take the next 55 to rest and enjoy the last few days as a free person on this earth! gosh- wow- it seems just the other day you made the announcement! How special and just think it can be a day or two early! I hope the babe is taking the same birthing class. It would be great if he did just what you're expecting him to do! Read the books out loud so he can listen and learn. None of my kids had taken the class and they came with a totally different agenda. Oh my goodness! 56 days? It feels like just yesterday that you were sharing the news with us. Wow, time sure does fly. Must see picture of the nusery!!!! Love that you are preparing me for the days to come, you make me so excited. My little one turns one this Sunday and I have been thinking a lot this week about what happened a year ago and the lead up to the big day. I had such anticipation of what my little girl would be like and couldnt wait to meet her. The reality was nothing like how I imagined and I realise now those days counting down were a sweet calm before an almighty storm called Ellie. A beautiful, wild, life changing storm that I love immersing myself in (no umbrella needed). 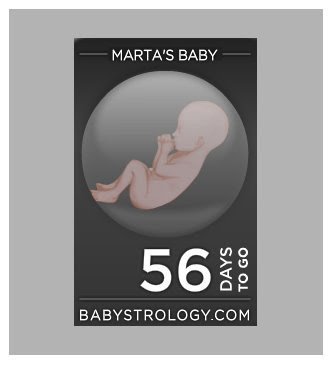 I will be counting down with you sweet Marta. see what i mean about your writing style. if you could bottle it up people would buy it. it's so fun and fresh. 56 days will fly by. maybe vera w. makes a hospital gown for birthing, and if she doesn't i'm sure there is a market for that. lord help us. Marta that's so great! 56 days is right around the corner--so fun for you. Just today I was telling Jake that Le' Baby loves the Jamba. After I had my Aloha Pineapple smoothie he was just all wiggles and dancing. So just to test it out I went for another one in the afternoon and same thing--total wiggle master and like you, I like to believe he is totally on the hot tamale train. So fun to keep up on what's happening with you and "the child"
I would love to see your list of books! I love the way you find the best way to put EVERYTHING in the perfect words. Thank you I love the thought of a due date as your wedding day but well.. slightly different. Love the widget - I am glad you waited until now to post it, now that it looks like a real baby and all. I am dying to see what you do with the nursery! I am trying to find a good prenatal yoga DVD. Any suggestions?